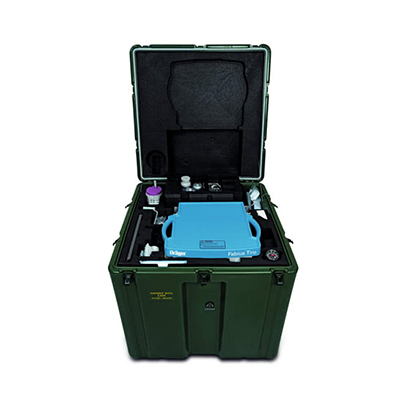 The Fabius® Tiro M is a compact anesthesia system that offers the full spectrum of anesthesia ventilation to military anesthesiologists/ CRNAs in the field of operations. This unit can be used in a variety of mobile and stationary military applications where general anesthesia is required. The modular design allows all standard system components to be stored in a single container so that assembly and disassembly of the unit is easily accomplished. Unit can be used in a variety of mobile and stationary military applications where general anesthesia is required. Modular design allows all standard system components to be stored in a single container so that assembly and disassembly of the unit is easily accomplished. Simple, modular design allows for full set-up within 15 minutes, without the use of tools. Easy-to-use interface reduces time required for clinicians to become familiar with the system. Integrated safety functions: Sensitive Oxygen Ratio Controller (S-ORC) guarantees a minimum O2 concentration of 23% in an O2 /N2O mixture. N2O cut-off if O2 fresh gas valve is closed or if O2 flow is less than 0.2 L/min. Audible and visual (flashing red LED) indication in case O2 pressure drops below 20 psi (1.38 bar) ± 4 psi (0.27 bar). In case of electricity and battery failure, manual ventilation, gas delivery and agent delivery are possible. Positive pressure relief valve opens at 75 ± 5 cmH2O. Negative pressure relief valve opens at -7.5 to -9 cmH2O. The modular design allows all standard system components to be stored in a single container so that assembly and disassembly of the unit are easily accomplished. Functionality and user interface are identical with currently marketed Dräger Fabius family anesthesia machines used in high-acuity civilian operating rooms. Electronically controlled, piston-driven ventilator uses no drive gas, decreasing fresh gas usage overall. The air entrainment capability allows the ventilator to continue to function in the absence of fresh gas flow, which is important in areas where central supply is non-existent and cylinder availability is sporadic. Fabius Tiro M offers the same performance and uses the same technology and user interface as the commercial Dräger anesthesia machines, including quality critical care ventilation modes. 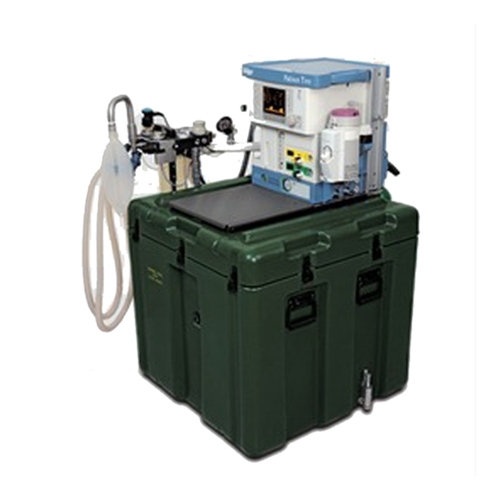 The Fabius Tiro M was designed to provide a full-featured anesthesia machine in a compact, easy-to-assemble package for use in military medical installations in the field. As an alternative in areas where a central gas supply is not available, Fabius® Tiro M can also use a defined oxygen generator.